The omnipresence of drones speaks for itself, and as more and more regions start to embrace these aerial machines, their improved iterations will slowly start to replace the older generation of products. Loon Copter is one such iteration that does not only possess the ability to fly, but it can also swim underwater, thanks to the efforts of some very talent individuals. 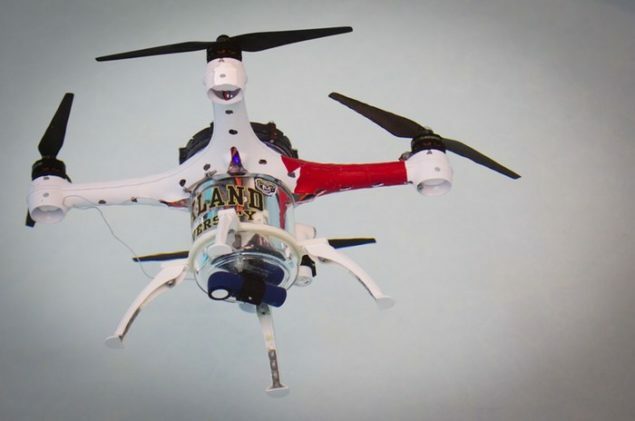 The drone was successfully developed thanks to efforts of individuals working at the Oakland University’s Embedded Systems Research Laboratory. Incorporated with the latest tech, Loon Copter might aesthetically resemble a regular drone, but it has one advantage that regular drones currently do not possess; able to traverse underwater till a specific depth. Since the drone is the first that we have seen till now, we are certain that it will only be able to travel till a certain degree underwater, otherwise the high pressure will wreak havoc with the internals of the machine. Due to this unique feature, Loon Copter was actually able to gain a position as a semifinalist product in the 2016 Drones for Good competition. If you look in the images and of course the video posted below, you will see that Loon Copter looks like a conventional quadcopter, and the only distinctions that separate the drone is a taller, barrel-like body. So how does the drone gain the ability to fly? 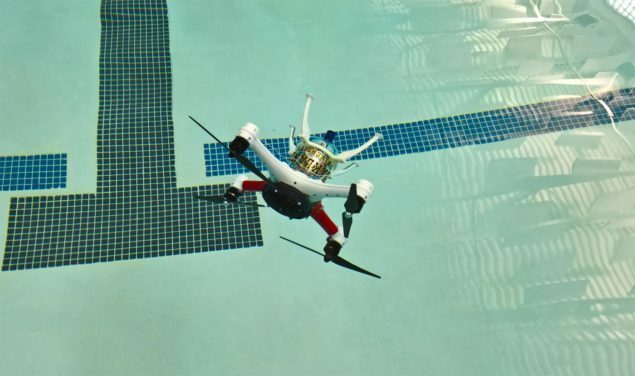 The drone is able to fill its buoyancy chamber, allowing it to safely transcend a few meters beneath the surface. Furthermore, the Loon Copter is also able to tilt 90 degrees, thanks to the incorporation of a very clever design. The propellers will start to act like outboard motors, allowing it to navigate around the sea. So if you want to capture some underwater footage or send the machine for an underwater expedition, then Loon Copter will easily be able do the aforementioned things, provided you do not take it below the recommended depth. Naturally, in the near future, we will see improved versions of the drones, but right now, let us enjoy the video and see how UAV is able to successfully traverse between the two elements.